TED DEKKER is the author of twenty-two novels, with more than 3 million copies of his books sold to date, 1 million of them sold in 2007 alone. / / Known for adrenaline-laced stories packed with mind-bending plot twists, unforgettable characters and confrontations between good and evil, Dekker has earned his status as a New York Times bestselling author. I thought I was going to love this book, being a Ted Dekker fan. I was wrong and the book let me down some. It was a story that if you mashed Speed with Saw, this is what you'd get. You'd think that would be exciting, but it fell short for me. The only part that I liked about the whole book was the super-surprising ending. Not what I thought would happen at all, and so far from the Speed-Saw mash-up in my mind. 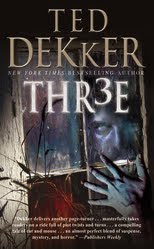 Too bad, I like the writing style of Dekker, so I'll still read more of his books. Just not my favorite. The concept sounds interesting but very contrived. Sustaining this for over 400 pages does seem difficult. Ohh, that it quite a let down since I love his books too. But I'll read it and see what I think of it..
Hi Freda. Wow!! This sounds like something I'll love. Thanks for sharing!!! Oh nooooo, what would be your recommendation to try for the 1st time reading Dekker? I chose this one but from a fan I think that may not be good now. Sorry it wasn't as good as you anticipated! I hate it when that happens. Wow, being a Dekker fan myself I thought it sounded interesting. The plot kind of reminds me of Velocity by Dean Koontz, but coming from Dekker I expected it to be better. Sorry it wasn't your cup of tea, but thanks for an honest review! Sounds like one I'll be avoiding. I agree with Suzanne, it sounds a little like the plot of Dean Koontz's Velocity which I loved. Too bad Dekker didn't come through with this one. I read this one awhile back and remember enjoying it but thinking it wasn't one of his best. Thanks for your comment on my review. I know .. this one was a big disappointment. I have two other Dekker titles sitting in my TBR pile and this one almost makes me not want to go ahead and read them. But I will read "Black", since it is on the Book Blogger's Recommendation list. I hope that I'll like it much better. This book was a bit too out there for me to find it plausible. I also felt that some of the interactions and character developments were forced. This book wasn't up to the usual Dekker standards.